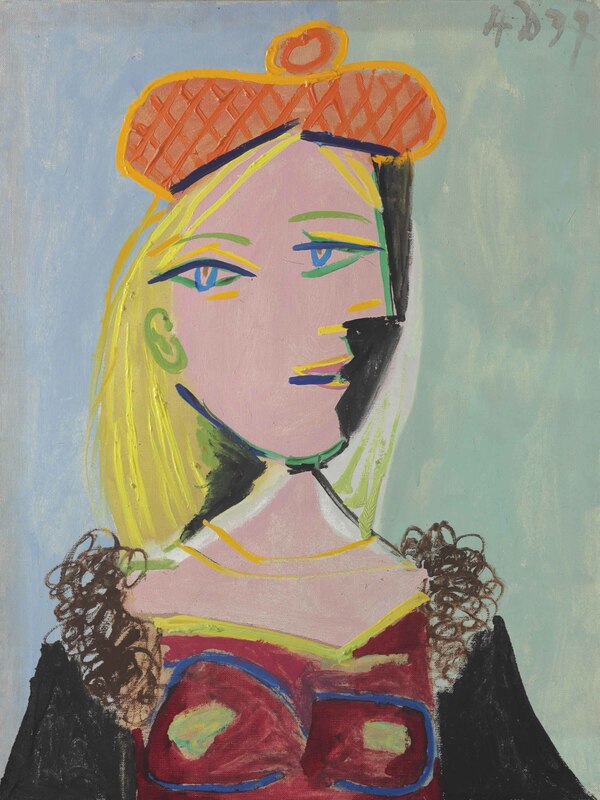 In its November 11 Evening Sale of Impressionist and Modern Art, Christie’s will offer Property from the Sam Rose and Julie Walters Collection, comprising a suite of four works by Pablo Picasso representing the artist’s muses, Marie-Thérèse Walter, Dora Maar, Françoise Gilot and Jacqueline Roque. Together, the collection is expected to exceed $28 million. Across more than half a century, Rose has ascended to one of America’s most prominent real estate developers, celebrated not only for his business acumen, but his belief in giving back to the community. Rose and his wife, Julie Walters, have committed themselves to empowering others—a generosity of spirit embodied in the couple’s collection of fine art. In their many years of collecting, Rose and Walters have come to amass a dazzling selection of examples of fine art by some of the greatest names of Modern, Post-War, Contemporary, and American art. This dedication to the arts included Rose’s tenure as a trustee of the Smithsonian American Art Museum, where the couple’s collection was shown in the 2015–2016 exhibition Crosscurrents: Modern Art from the Sam Rose and Julie Walters Collection. Leading the collection is Femme au béret orange et au col de fourrure (Marie‐Thérèse), 4 December 1937 ($15,000,000 – 20,000,000). The young blonde woman featured is distinctly Marie-Thérèse Walter, Picasso’s clandestine mistress and the mother of his second child, Maya. “Marie-Thérèse incarnated a wild beauty, a sporty and healthy beautiful plant,” Brigitte Léal has written. Always attentive to his muse’s particular taste in attire, and how it characterized her, Picasso has flattered Marie-Thérèse in a stylishly cosmopolitan scooped-neck dress trimmed with fur, while happily exploiting a more casual but crowning accessory in the shape of a jaunty red plaid beret, which he used to accentuate her lavender-pink complexion and signature golden shoulder-length tresses. Françoise Gilot, Picasso’s later mistress from 1943 and mother to two of his children, as well as the subject of a rhapsodic portrait in the present collection, had occasional contact with Marie-Thérèse during the post-war period. 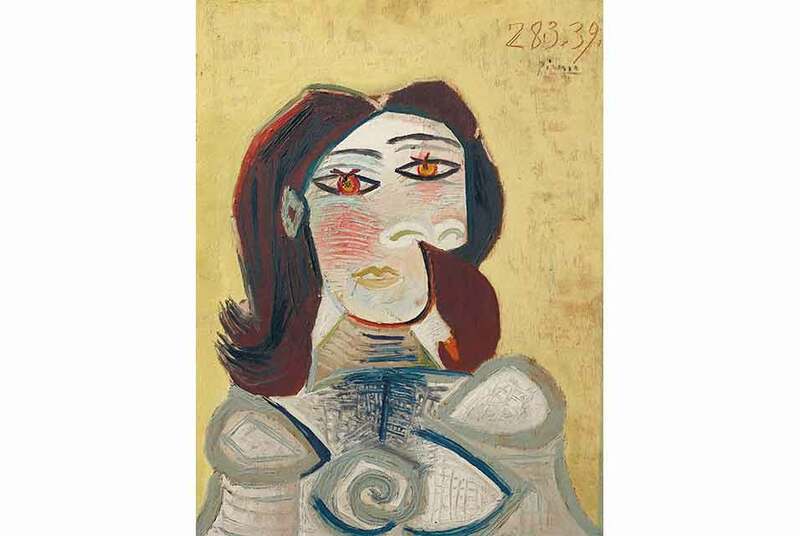 Pablo Picasso, Buste de femme (Dora Maar) 28 March 1939, oil on panel. Estimate: $5,000,000 – 8,000,000. © Christie’s Images Limited 2018. Following Marie-Thérèse, was Dora Maar, who is depicted in Buste de femme (Dora Maar) painted on 28 March 1939 ($5,000,000 – 8,000,000). Picasso continued to alter and reshape Dora’s visage in new, astonishing and challenging ways, which Dora neither protested nor resisted, assuming a role that she accepted almost masochistically. Dora had already done service two years earlier as the Weeping Woman soon after Picasso painted Guernica. In the present painting she widens her eyes—in the shapes of glowing red cherries—as if mesmerized, staring in the face a challenge far greater than any she has ever known, a clear and present danger, and more of the same in the distant shape of things to come. Picasso had already made Dora his modern Sybil, employing her as a silent oracular presence whose facial expression of inner distress bespeaks her prophecy. Dora would remain the central, defining presence in Picasso’s wartime paintings. Picasso painted his second wife Jacqueline about as often as he portrayed Dora. Jacqueline represented for the artist a sort of atavistic, Mediterranean ideal, dark and intense. The new style with which he presented her was marked by irrepressible energy and liberated handling of paint. She was his final muse who oversaw the late, great Indian summer of his career.